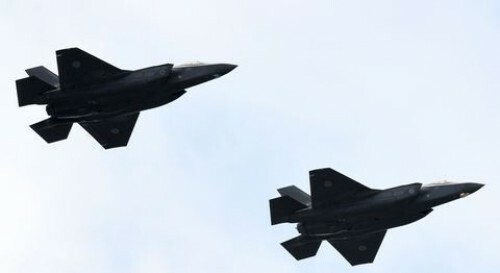 Hong Kong : A Japanese F-35 stealth fighter, one of the world's most-advanced warplanes, has gone missing over the Pacific Ocean, Japanese defence officials said. According to officials, the single-engine jet from Japan's Air Self-Defence Force was on a training flight with three other F-35s when contact was lost Tuesday evening, public broadcaster NHK reported. The pilot of the single-seat fighter is missing, and a search is underway, according to Japan's Defence Ministry, CNN reported. No problems with the aircraft were reported before it went missing. The Japanese jet, a F-35A model, would be the second lost to an accident. A US Marine Corps F-35B crashed in Beaufort, South Carolina, in late September. US defence officials in October said a faulty fuel tube was the likely cause, and all F-35s operated by the US and its allies were temporarily grounded for inspection. Japan is one of 14 countries in the F-35 programme, according to the plane's maker, Lockheed Martin Corp. Tokyo announced in December it would be buying 147 of the planes, making it the biggest customer for the aircraft besides the US. At present, some of the Japanese F-35 are assembled in the US and others at a plant in Nagoya, Japan. It has not been revealed where the plane that went missing Tuesday was built.